Motherhood tends to leave you susceptible to many aches and pains. Breastfeeding often can add on stress to your body whether it is with a newborn or an older baby. You probably often find yourself hunched over in a rocking chair with shoulders rolled forward. Or, perhaps you have a kink in your neck while you try to tame a toddler who is doing gymnastics all while still nursing. It is important to take time to heal and cultivate a time to care for yourself. This is true whether you are freshly post-partum or a few years out. If you are suffering from some neck and back pain from breastfeeding, try these poses as a means of relief. The focus here is drawing those shoulder blades back and down. Then wrapping your arms with right arm under left, placing palms together and bending at the elbows. Lift elbows up and stretch fingers towards sky. Focus on lengthening the neck and stretching shoulders. I love this pose as a mom. It can easily be done in bed, or while baby is quietly playing. This is always my go-to move for any shoulder or lower back pain. Start with legs wide. Clasp your hands behind your back. Then hinge your upper body forward while lifting your clasped hands off your back. Let your head hang heavy and breathe. The different variations and target muscles makes this a versatile pose and meets people where they are at. This backbend helps alleviate tension and aches. It does this by not only stretching the muscles in the lower back but also the front and side muscle groups too. To do this, grab a bolster or rolled up blanket. Place the prop horizontal and sit down. You will want to scoot back towards the prop. Then lay back on it so it supports your upper back, with the tips of your shoulder blades at the center of the prop. Your head should be on the floor just beyond your prop. Legs should be straight out. From here you can play with your arms to see what feels best in your body. They can be straight out like a 'T', or bent at the elbows, or arms overhead. Listen to your body. Stay here and send your breath to wherever there may be tension. This is my go-to no matter how my body may be feeling. This pose just feels like home. It grounds, balances, and renews me. The great thing about this pose is you can do it in bed or even on the floor playing with your children. 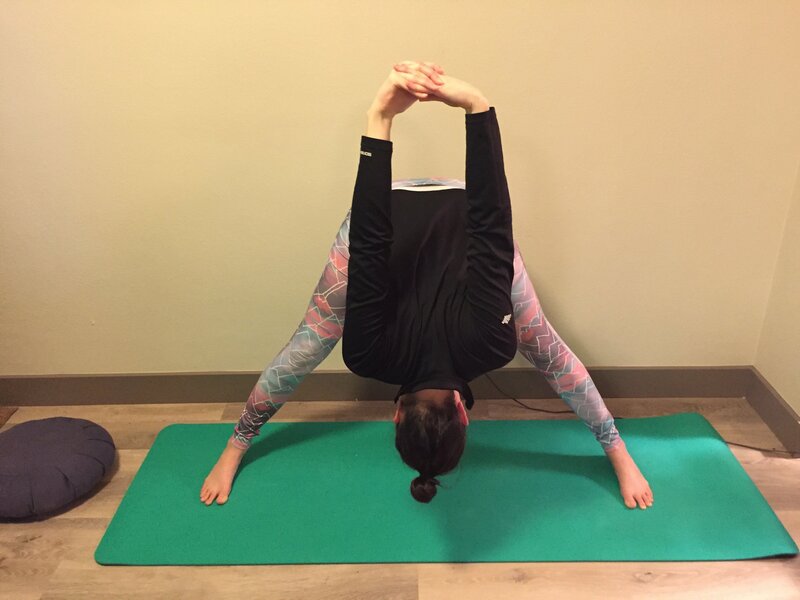 I start in traditional Child’s pose and then I move my hands out front, overhead. Then by following my breath, I slowly walk them to my left and hold, then to my right and hold. I do this as many times as feels right. The wall is an underused and underrated prop, yet there are multiple ways you can deepen your stretches by simply using the wall. Doing poses like Dolphin or Down Dog on the wall let you go deeper and hit muscles you may not normally get in the traditional pose. It increases the release of tightness and tension in the neck and shoulders. Another favorite of mine is placing one hand and that forearm horizontal on the wall so your fingers are pointing back. Then turn so that shoulder meets the wall. I hold this for as long as feels comfortable. I may even throw in some neck rolls or looking over my other shoulder until I hit that sweet spot. Motherhood and breastfeeding can be challenging at times but in order to take care of our loved ones, we also need to remember to care for ourself. Throw in some neck rolls or arm stretches in the shower. Place those legs up the wall while baby naps. It may not seem like a lot or even worth it, but that moment of being present in mind, body, and spirit will make you feel so much better.